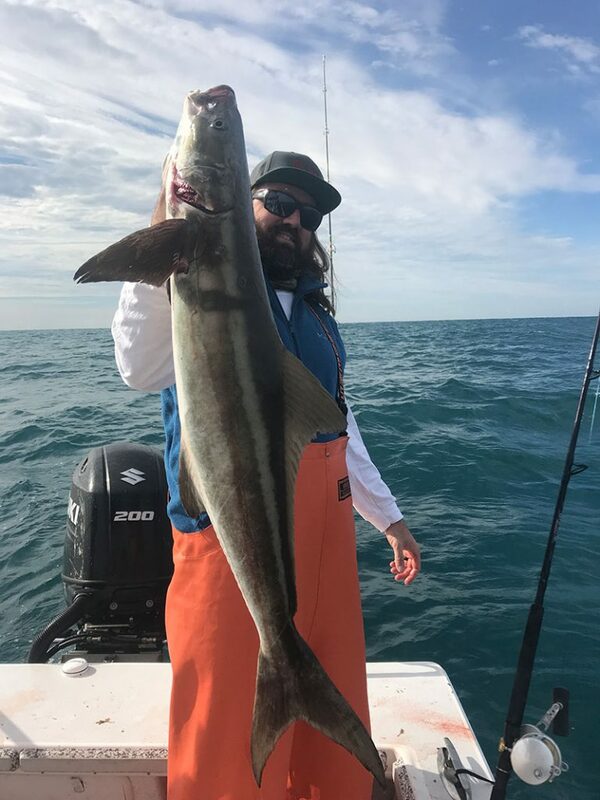 Jeremy Stock of St. Petersburg, older brother of charter fishing guide Jason Stock, shows off a nice cobia caught offshore Nov. 29 along with amberjack, grouper and kingfish while spending a workday on the water with the captain. 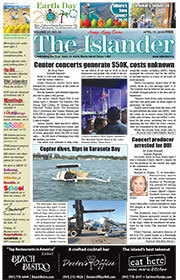 With cold from the north becoming more frequent, you might say fishing is in a transitional phase, but it remains good around Anna Maria Island. You see, as water temperatures drop, some fish change their habits. This can include where they can be found, when they feed and what they want to eat. Knowing their cold-weather habits is key to hooking up with any species. One such fish is snook. During the spring, summer and fall, snook are readily available on the flats and along the beaches. Live shiners as bait are like candy to snook as they feed heavily. The fish also will take a variety of other live baits, as well as artificials. When the winter weather arrives and water temps drop into the low 60s, you may notice snook are harder to find. They don’t like cold water and migrate to areas where they find consistently warm water. When you find snook in the winter, you’ll also notice they don’t behave as aggressively as they do in the warm summer water. The colder water causes them to be lazy. As they attempt to stay warm, they conserve energy. This influences the bait you choose. Shiners and other live baits — pinfish and mullet — swim too fast for a lazy snook to pursue. But using shrimp or soft plastics with a slow retrieve attracts their interest. Snook become opportunistic, which means they would much rather swim up to something to eat and nonchalantly inhale. They just don’t chase bait in cold water. Luckily for us, there are other fish to catch in the winter. Some species that come to mind: black drum, redfish and sheepshead. The colder water temps don’t deter these fish from eating. In fact, the sheepshead get fired up. Also, these three species will readily eat live shrimp, which is the most accessible bait during the cooler months. Another cold weather target is inshore gag grouper. With the arrival of the cold, the fish migrate into the shallow waters of Tampa Bay, making them accessible to inshore anglers. Trolling lipped plugs or using large live baits, such as pinfish or grunts, will attract gags to bite. Finally, the deeper grass area of Tampa Bay and its water to the south can be host to a variety of species during the winter. Spotted seatrout can be caught in great numbers along channel edges adjacent to the flats. Same for pompano. You’ll also find jack crevalle, ladyfish and bluefish in the mix. So, as cold settles in, don’t be discouraged. There are plenty of fish to catch in December, January and February. Just change up your technique and you can find success. 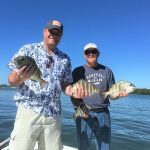 On my excursions with Southernaire fishing clients, I’m finding numerous sheepshead and flounder around the passes and channel edges. Offerings of live shrimp are yielding good action on either species — especially the sheepshead. I’m also catching and releasing an occasional undersized snook in the same areas. Spotted seatrout are cooperating over deep grass flats. Casting live shrimp under a popping cork or free-lining live shiners is getting a positive response. Jack crevalle, bluefish and ladyfish are finding their way to the hook. Capt. Warren Girle is finding a good bite using live shrimp as bait. Casting the shrimp under docks or around other structure is yielding sheepshead, black drum and catch-and-release redfish. Fishing grass flats with live shrimp is producing some action on spotted seatrout and jack crevalle. When fishing the grass flats, Girle is using a popping cork to keep the shrimp suspended midway through the water column. This aids in keeping the pinfish away from the bait so it can be noticed by game fish. Capt. Aaron Lowman is finding decent action on spotted seatrout, as well as catch-and-release snook and redfish. Fishing between the cold fronts when the weather is warm and the seas are calm is proving to be the best time to get a bite. Using live shrimp as bait around reefs and docks is producing a sheepshead bite, as well as bites from other species, such as black drum and flounder. Placing a live shrimp on a 1/4-ounce jig head and slowly dragging the bottom is resulting in a strike. 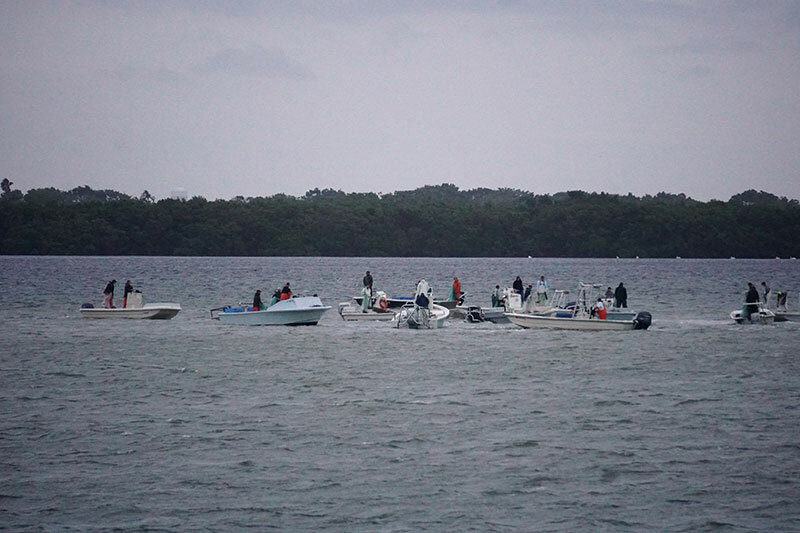 Lastly, trolling for inshore grouper is yielding a few keeper-size fish. Jim Malfese at the Rod & Reel Pier says fishers using live shrimp as bait are hooking into a variety of species. While bottom fishing with shrimp, fishers are reeling up sheepshead, black drum and a few flounder. Tipping jigs with small pieces of fresh-cut shrimp is attracting attention, too. 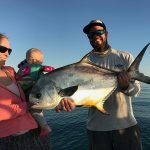 Casting these jigs out from the pier and bouncing them along the sandy bottom is producing action for pier anglers on ladyfish, jack crevalle and a couple of permit. Capt. 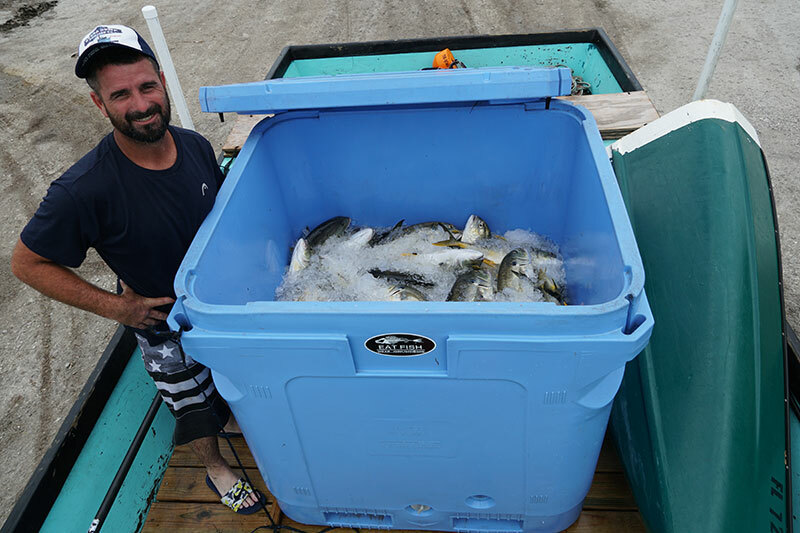 David White of Anna Maria Charters is doing well for his fishing clients in Tampa Bay. Sheepshead are moving in around structure and are eating live shrimp. White likes to use a small jig head combined with a live shrimp to get the fish to bite. Targeting gag grouper in Tampa Bay is producing good action for White. Live pinfish dropped to the bottom around structure is a sure-fire way to attract the gags to the hook. Trolling lipped plugs is producing action. On the flats of Tampa Bay, White is guiding his fly-fishing clients to some tough adversaries. Large jack crevalle are on the prowl on the flats, which makes them excellent targets for a fly fisher. These jacks — in the 10-pound range — can take up to 15-20 minutes to reel in once hooked on the fly. White and his clients love the challenge and, even better, they are catch-and-release. Capt. Jason Stock is catching respectable numbers of gag grouper in Tampa Bay. Trolling lipped plugs or using live pinfish as bait is attracting a bite. Moving offshore, Stock is finding an abundance of mangrove snapper. The fish are rising to the surface as they feed in the chum slick, which makes them easy targets. Free-lining live shiners into this frenzy is resulting in immediate hookups. While offshore, Stock is finding amberjack and blackfin tuna. To catch these hard-fighting fish, Stock is casting large artificials on the surface and quickly stripping them in.